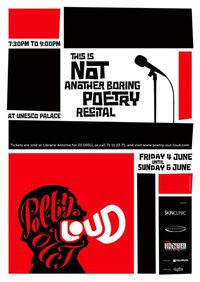 PoetryOutLoud, seasonally, throws a poetry event, where a number of its members share and perform their work of poetry freely. The audience gets to experience different ideas and emotions that the poet would like to convey. Collectively, we explore new areas of expression and reaching out. The works are not restricted to any language. To participate in the group and future events, or if you have any questions please check the "Join Us" and "Contact Us" pages on the website.